Click Brittany on the map below for full information on cruising areas. Click on base names for detailed maps and cruising routes for cruiser boats and penichette boats. Brittany offers picturesque cruising under warm, sunny skies. Its unique culture, medieval towns and romantic castles make for a perfect holiday. Read our guides to Boating Holidays in Brittany. In Brittany our three cruiser boat bases include medieval Dinan and many route options. Our penichette base is at Redon, known as the Venice of Brittany. 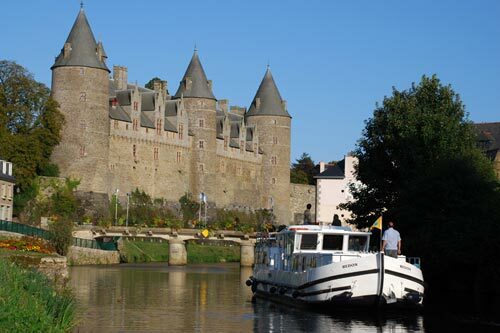 Cruising highlights include the chateau at Josselin, Rennes, the capital of Brittany, and many castles. Oysters and Breton crepes are found everywhere.